Argeles-sur-Mer is a town and seaside resort on the Mediterranean coast of France, near the border with Spain and on the section of coast known as the Cote Vermeille. 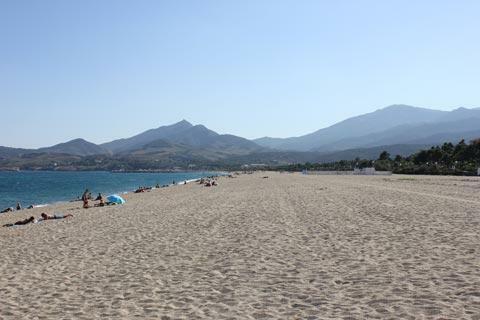 It is in an attractive setting with the low hills of the eastern Pyrenees and the massif des Albères behind the beach and Mount Canigou visible beyond. Argeles-sur-Mer is a popular and pleasant resort on the Languedoc coast, mostly visited for the activities along the coast and beach. The sandy beach is almost seven kilometres long, and interspersed with rocky pools and has been awarded the Blue Flag award for its cleanliness and facilities. It is the most important resort on this stretch of the coast. The beach and coast here is also used for watersports such as windsurfing and scuba diving. Next to the central part of the beach there is a pleasant promenade that is about three kilometres long and in part backed by a large pine forest. Of course, the central parts of the beach at Argeles are supervised by lifeguards during the summer. There are also facilities to enable disabled people to use the beach. A short distance inland from the Mediterranean, Argeles is a pleasant town in the Catalan style with some interesting narrow streets to explore in the remaining part of the historic village. Most of the original ramparts have now disappeared though on Rue du 14 Juillet you can see the Jalabert tower and various other sections can be seen as you wander the streets. You can ascend the belltower in the Church of Notre-Dame-del-Prat for views across the region. This belltower is 34m high and as well as a belltower it served as a lookout post and signal station. 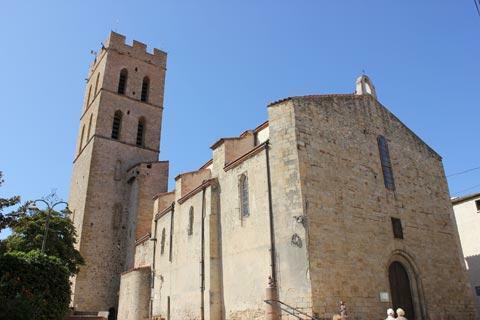 Particular highlights close by include the pretty little Chapel of Saint-Jerome d'Argeles and the Hermitage of Saint-Ferreol-de-la-Pave: both of these are very old 10th century chapels in the roman style. Church enthusiasts will also want to visit the Church of Saint-Laurent-du-Mont a little way south of the town which is a beautifully preserved 12th century roman style church. General information: in 1939 a large prisoner camp was established just north of Argeles-sur-Mer to house thousands of republicans fleeing Spain after the end of the Spanish War. 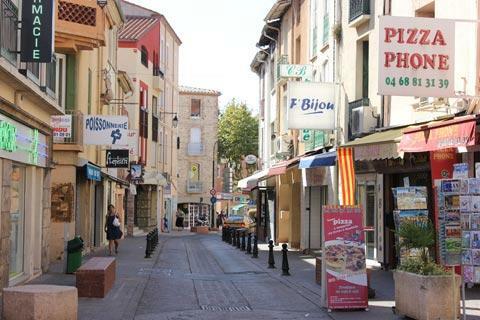 Argeles also has a pleasant tree lined port whose edges are lined with restaurants. It is a very pleasant spot to sit outside at one of the many restaurants and eat dinner overlooking the harbour. You can also stroll along the seafront to the attractive coastal hamlet of Le Racou. Starting from Argeles you can walk the coastal path from the nature reserve of Mas Larrieu. The walk takes you past many coves as well as the pretty beach and hamlet of Le Racou near the Port. Another popular trip from Argeles is to Valmy to see the lovely views and and the eagles soaring overhead. There is also a 19th century 'chateau' at Valmy which is interesting to architects because it was one of the earliest buildings constructed with reinforced concrete, although you might not guess just by looking at it, it is now a chambre d'hote. En route for Valmy you can visit the defensive Massane tower which was built in the 13th century on a rocky peak, while the sturdy square tower that is all that remains of the 12th century Chateau de Pujol is a little way north of the town. 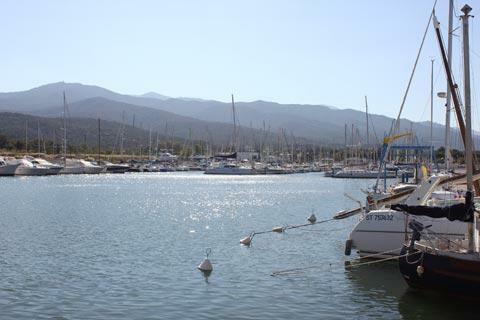 Argeles is just a few kilometers from Collioure, a very attractive port and beach with a castle and lively old town. A trip north to explore Perpignan is also enjoyable, then a little further you can explore the Pyrenees foothills along the Têt Valley or take a trip to one of the cathar castles such as Château Peyrepertuse. See more of the popular beaches and resorts in Languedoc. You can find more local travel ideas in the Pyrenees-Orientales guide and the Languedoc-Roussillon guide. Regular market(s) are held in Argeles-sur-Mer each Wednesday & Saturday.